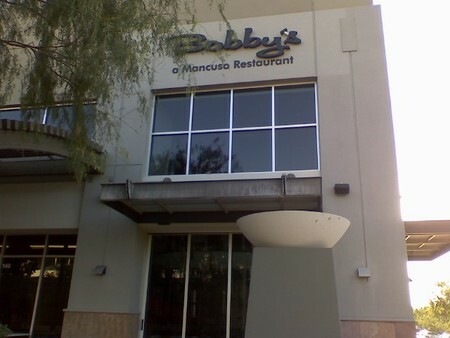 Conveniently located in North Scottsdale’s Kierland Commons, Bobby's restaurant and lounge is the place to go if you want a cosmopolitan dining experience encompassing live music, futuristic decor, and delicious cuisine. With nightly jazz music, contemporary Mediterranean fare, a tantalizing wine menu, and a touch of humor - see the photos of the musicians named “Bobby” on the north wall - it is sure to delight all five of your senses. Don’t leave without checking out the upstairs lounge and changing color wall. Bobby’s, a Mancuso restaurant, was located in the Borgata for over two decades before moving further north three years ago. Now situated in a modern building within the prestigious Kierland Commons, the new location has proven itself to be a high-class restaurant and lounge. The new location provides ample parking and valet service. While you may score a parking spot, you will undoubtedly have to make reservations if you plan to dine there during the peak tourism months of October through April. Don’t despair; Bobby’s has ample seating, offering an outdoor dining area in addition to their first-floor restaurant and second-floor lounge. Bobby’s also boasts a communal table and a private dining area for large parties. The Saturday night we arrived, we were lucky; we had not made reservations but were seated immediately. The weather was still too hot to sit outside, so we were shown to one of a series of booths on the first floor. The booths, located beneath a wall of pictures, were made of white leather half-circles that could seat up to four comfortably. The booths were in an ideal spot to people watch. In the dimly lit, reddish-hued environment, we were still able to take in the mod decor. With elements such as lava-like lamps separating the first floor dining area and shimmering beads that circle the upstairs lounge, the restaurant seemed worthy of being in Miami or Los Angeles. As we glanced at the photos on the wall above us, I chuckled as we learned the photos are all of famous musicians named “Bobby,” like Bob Dylan and Bob Marley. As our eyes circled the room, we looked to the upstairs lounge where a lively rhythm and blues band was playing jazz tunes that floated down to the first floor dining area. The music was just the right level so as to not ruin our conversation. In order to get to the upstairs lounge you have to walk up a circular staircase. While attractive, it looked a bit treacherous and I was relieved to find out there is an elevator, in case an alternative route is needed. It is important to note there didn’t appear to be a bad seat in the place. The kitchen is off to the side, behind the stairs, making it barely perceptible. This makes the restaurant feel warm, cozy, and relaxing as diners are not distracted by the hustle and bustle of an open kitchen. Our waiter, Phil, greeted us and immediately offered dinner and wine menus as he highlighted the specials of the evening. We began by ordering drinks. My guest ordered a martini: vodka, straight up with a twist. I perused the wine menu, which contained a number of California wines, before choosing a glass of Dynamite Merlot. When the drinks arrived, my guest’s came exactly as ordered, with a light glaze of ice floating on top. The glass itself was of good quality, adorned with a decorative lip and pleasing to hold. The Dynamite Merlot had a clean finish and left a pleasant aftertaste that complemented the Bruschetti appetizer we ordered. A metal basket was delivered to our table. It contained four rolls that were crisp and warm to the touch on the outside, but hot on the inside. A plate of butter accompanied the bread and was artfully presented in single-serving half-circles that dotted the white china. The Bruschetti arrived a short time later. The plate was a masterpiece. Six crisply toasted slices of bread surrounded a bed of red cabbage decorated with a rosemary sprig and olives. The bread was drizzled with a mixture of olive oil and balsamic vinegar. The chopped tomato basil mixture was addictive, and we soon realized that we had eaten all but one slice. Next, my guest and I ordered salads. 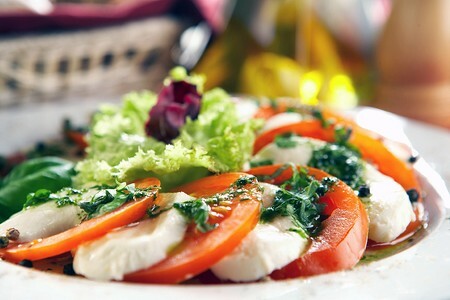 When the salads arrived, they looked extremely fresh; I was certain they had just been made. The Caesar Salad came with fresh romaine lettuce, fresh slivers of parmesan cheese, and croutons. The dressing was aromatic, containing garlic and finely chopped anchovies. The House Salad was made with romaine lettuce, thinly sliced carrot corkscrews, sliced cucumbers, red cabbage slivers, and fresh mushrooms. The vinaigrette dressing tasted amazingly good, as the mustard flavor did not overpower the contents of the salad. For entrees, we chose the Combination Pasta and the Fresh Black Cod. Having never heard of Black Cod, I was curious about this entrée. Both meals arrived piping hot, impressive for the different types of food we ordered. The Black Cod was served on a bed of saffron rice with stewed artichokes, sun-dried tomatoes, roasted red peppers, and spinach in a garlic chardonnay sauce. The fish was cooked to perfection, flakey and tender. It melted on my tongue. Surprisingly, the vegetable flavors did not overwhelm the fish and, in fact, all of the flavors melted perfectly together. Later, I learned that Black Cod is not really cod at all, but rather Sablefish. Sablefish, a cold-water fish found off the Pacific Coast and in Alaska, resembles cod; hence, the name. It is prized for its salmon-like texture and rich oil content. The Combination Pasta arrived on a large white plate and included small portions of Lasagna Marinara, Four Cheese Tortellini Alfredo, and Linguini Pesto. The Lasagna Marinara was filled with seasoned beef, marinara sauce, ricotta cheese, and generously topped with mozzarella cheese that melted over the edges. The Tortellini Alfredo contained cheese-filled pasta lightly covered with a white alfredo sauce. The alfredo sauce was one of the best I had come across. The linguini was served al dente; the green pesto provided just the right hint of basil, olive oil, and pine nuts. Despite the different sauces, each of the pastas presented managed to contain their unique flavoring. It was clear that Bobby’s cares equally for quality, freshness, and presentation. Unfortunately, we were so full from the appetizer, salads, and entrees; we had no room left for dessert. I blame the Bruschetti – it was addictive. Bobby's is the place to go if you want a cosmopolitan dining experience encompassing live music, futuristic decor, and delicious cuisine. With nightly jazz music, contemporary Mediterranean fare, a tantalizing wine menu, and a touch of humor—see the photos of the musicians named “Bobby” on the north wall—the restaurant promises to delight all five senses. Main Dining Room | Lunch 11 a.m. - 5 p.m.
Main Dining Room | Bar 10:30 p.m. - 1 a.m. I ordered the meat trio and I was far less than impressed. The filet was overcooked, the lamb was like shoe leather and the pork tender loin was sub par at best. The only tasty thing on the plate was the potatoes. I think the only reason people would eat here is if The Ocean Club was booked solid.